It’s hard to believe July has yet come and almost gone, and even summer, for that matter. What started out as a relaxing warm spring, has morphed into a bustling hot, hot summer that’s setting all time heat records. With that said, not as many records as the US Olympic team is doing at the Summer Olympics in London. A few short weeks ago, I launched THE WEBSITE. Annie Steele Photography was born and the real work had begun. I’ve had to teach myself, reteach myself, and constantly remind myself hard work will pay off. Since I love meeting people and taking beautiful pictures, I have to just do all the millions of little things that go along with running a business. I suppose thoughtful gestures along the way does help exponentially. Besides all the sweet e-mails and love notes I have received, I’ve had some very sweet past bride and grooms encourage me making my business officially official. For example, Stephanie and Ismael, sweetly treated us to a delicious Italian dinner in their trendy, new neighborhood. Lauren and Ralph came to visit us last week and brought pink bubbly and treats for the new mascot. And, Amanda and Jason have socially networked my name all over Facebook and Twitter. I’d love to add them to my payroll, but I really can’t afford them:) THANK YOU, THANK YOU! As part of THE NEW BLOG, I’ve added a blog post that will be posted at the end of every month highlighting some of my favorite Instagrams over that month. If you follow me on Instagram, then you are well aware of how much I love this little app (fine… it’s my favorite). I will outline 4 of my favorites, both personal and having to do with my business, and tell you all about LIFE IN INSTAGRAMS. HAPPY EVERYTHING. Earlier in July, my entire family was able to get together for a Fourth of July mini vacation. My sister, her husband and the new baby came in from NY and we all went to my parent’s cozy, Wisconsin cabin. We relaxed, competed in the 1st Annual Richmond Relay Round-up (yes, we had t-shirts), and soak up the sun in honor of celebrating independence. Located on a private lake, it is one of the most peaceful places in the world to just breath. This particular picture was taken out in the middle of the lake just before sunset. ROCK + ROLL HALF MARATHON. My motto of always a spectator, never a runner changed this year. With having little to do with self determination, and lots to do with my runner husband’s nagging motivation, I signed up, ran, and CROSSED THE FINISH LINE after a sweltering 13.1 miles (HOLLA!) My brother and sister-in-law and adorable niece made a sign for Peter and I that read, “You Rock, Peter and Annie.” Running down Michigan Avenue and barely to mile marker 7.5 miles, I saw Tim, Katie and Callie cheering for us. I was so excited that I whipped my I-phone out and took a picture showcasing the highlight of my run. A DAY WELL SPENT WITH MY MOMMA. 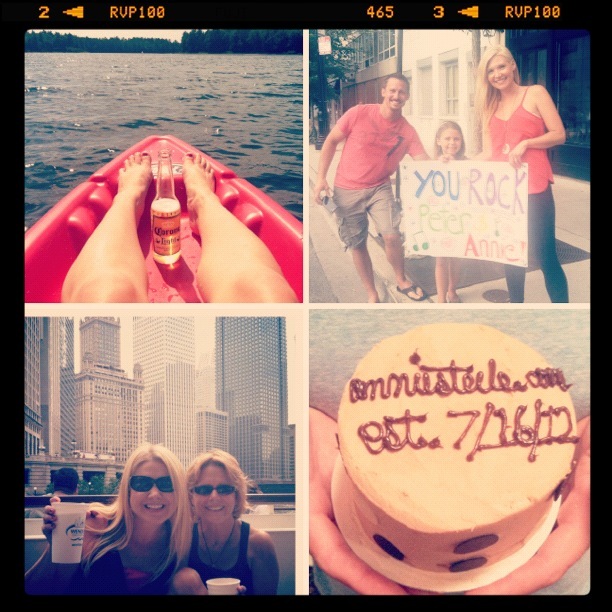 Last Thursday, my mom came to Chicago to spent a day with her girl. She works at a school and lucky for me, has the summer to relax and plenty more reasons to come and visit me. We decided to take an architectural boat ride down the Chicago River. Boat rides in Chicago never get old, and you always learn something new and exciting about the Windy City’s history. Afterwards, we went to dinner, did some shopping and came home later to spend time with one another. She is the most important woman in my life and I thank my lucky stars she’s my momma. MY HUSBAND “LIKES” ME. DO YOU? Last, but not least, is my hunny holding a cake to commemorate just another day. Having worked numerous hours and several months on ideas, designs, logos, and creating a business would not have been possible without the love and patience of that guy. He has voiced to keep going when I wanted to quit, and to put my shoulders back when I wanted to curl in a ball. On July 16, 2012 when I launched my website, he brought home flowers and a cake. I’m one lucky girl. Hope you had a fantastic July and even better August to come!